With this setting, every image uploaded with the file selection is automatically made smaller and shown as a thumbnail in view tables. Provided it has already been saved, the image will be shown in its original size in a new window when the user clicks on the image. This setting can only be selected, if the setting "Enable download" is not activated on the General tab. Rotates the image in its original size. Analyzes the image orientation and rotates it accordingly. Define the maximum height and width that an image can take up in pixels. Larger images are reduced proportionally but smaller images will not be changed. The image's width and height will be adjusted based on the surrounding element. If this setting is selected as well, smaller images are enlarged to the preset maximum size. Causes the file size to be reduced in order to speed up loading the application page. If the uploaded file is not an image, you can decide how the thumbnails will be shown here. 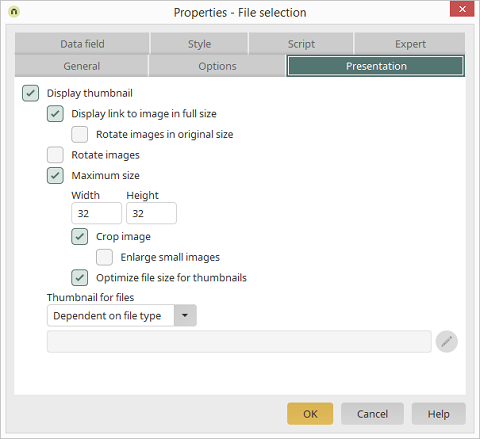 With this setting, you can define which file extension is linked with which thumbnail image in the file "fileextension.properties" which is found in the Portal directory /internal/cfg. An image defined by Intrexx is used. An image can be selected in the dialog that opens.